susan pui san lok’s recent exhibition (19 September – 15 November 2015) at Derby’s QUAD Gallery premiered a new body of work entitled ‘RoCH Fans and Legends’, which travelled to Manchester’s CFCCA (Centre for Chinese Contemporary Art, in partnership with Animate Projects and the University of Salford) to conclude their 30th anniversary programme of exhibitions. The work provokes questions around the dichotomies of fact and fiction, fandom and auteurship. A legend is a tale whose origin may have historical or imagined roots, or a mixture of the two. A legend’s retelling provides a source of entertainment – a fantastical distraction from reality, from life as it is lived in the present moment. It may also function to mark the significance of past pursuits – the historical-everyday or the bygone-peculiar. Legends remember and reinvent. To some extent, we can read them as sources of cultural memory in the guise of stories. susan pui san lok’s recent exhibition (19 September – 15 November 2015) at Derby’s QUAD Gallery premiered a new body of work entitled ‘RoCH Fans and Legends’, which travelled to Manchester’s CFCCA (Centre for Chinese Contemporary Art, in partnership with Animate Projects and the University of Salford) to conclude their 30th anniversary programme of exhibitions. The work provokes questions around the dichotomies of fact and fiction, fandom and auteurship. She has referred to her own experiences of watching bootleg videos during the eighties as a child growing up in Essex, ‘dislocated from and reconnected to local Hong Kong culture by a disparate yet entrepreneurial immigrant community’;2 getting hooked on epic wuxia dramas; and the growing sense that martial arts is not a subculture in Hebdige’s sense, differentiated from a ‘parent culture’,3 but rather a facet of the more complex, contemporary, heterogeneous global visual culture that Mirzoeff most recently talks about in How to See the World.45 For lok, the last artist to figure in a series of exhibitions featuring Xu Bing, Cao Fei, Lee Mingwei and Tsang Kin-Wah, CFCCA’s anniversary programme highlights the contestations, contradictions and indeterminability of ‘Chinese culture’ from several diasporic, postcolonial and expatriate transitions. In QUAD’s lower gallery, we experience the visual and spatial impact of RoCH Fan, a double-sided concertina artist book multiple, illuminated in a long glass vitrine. The concertina extends to over eight metres long (or ‘three and half storeys high’, as the artist puts it) and collapses into a VHS-sized case, thus referencing 1980s mass culture and video hire. However, its display also suggests an ancient, illustrated manuscript of a parable, whose scenes unfold as the visitor follows the vitrine through a museum room. susan pui san lok, RoCH Fan, 2015, concertina muitiple, 102mm x 187mm x 8415mm, Derby QUAD, photo: Charlotte Jopling. The main gallery presents Trilogies, a three-screen installation of sequences edited from thirteen different television adaptations of The Condor Trilogy, produced between Hong Kong, Singapore, Taiwan and mainland China from 1983 to 2014. The footage has been sourced from videos pirated, ripped, downloaded, uploaded and shared by fans. The clips feature wuxia sword-fight moves typical of the genre which involve jumping or flying, representing weightlessness and superhuman or indeed supernatural powers. The tripartite arrangement of concurrently running films – some 400 hours of footage condensed into three sixty-five minute sequences – conveys a sense of past, presence and future, as both separate and merging. As television film quality differs through the decades, so do the stylistics of flight and weightlessness. Between Trailers and Trilogies, lok’s work instigates a questioning of fiction and reality. Trailers references the streets in which ‘real’ people live, photographed recently. As the ‘real’ and largely empty streetviews generated by Google alternate with filmic and televisual scenes, the separation of fiction and reality becomes confused, demanding an endless negotiation of the two, turning on the glimpses of dragons in the high street, evoking the fantastic in the midst of the mundane. The looped montage of adaptations and re-versionings in Trilogies can be seen as an homage of sorts, both to the objects of fandom, and to the fans themselves who, posting under avatars, are people as anonymous and unbeknown to lok as the Google street view photographers. While Google photos record everyday scenes for utilitarian or surveillance purposes, and fans re-record the semi-imaginary, staged settings of the condor trilogy for social media and personal entertainment channels, in both cases such imagery, legally or illegally redistributed in the online domain, can be said to both orientate, and be orientated towards, the masses. The amalgamated wuxia footage – repetitive, figurative, invoking the supernatural – can be viewed as simulacra: copies for which there is no clear or authentic original – the adaptations based on books which revise their earlier serialised versions, which themselves draw from the legends and archetypes that populate a centuries’ old literary tradition, and century-old cinematic genres, based around the ‘xia’ – the heroic, chivalrous, non-conformist outsider warrior figure. Moreover Trilogies contributes to this aura of the hyperreal. Comprised of ‘readymade’ wuxia footage, the work becomes a self-referential meta-epic of its own – one which both disrupts and consolidates recognisable narratives. The discombobulation that is cumulatively created by repetitive movements, as well as their literal groundlessness, work as a reminder of the intangible and tenuous nature of memories – personal, cultural and collective, always constructed. 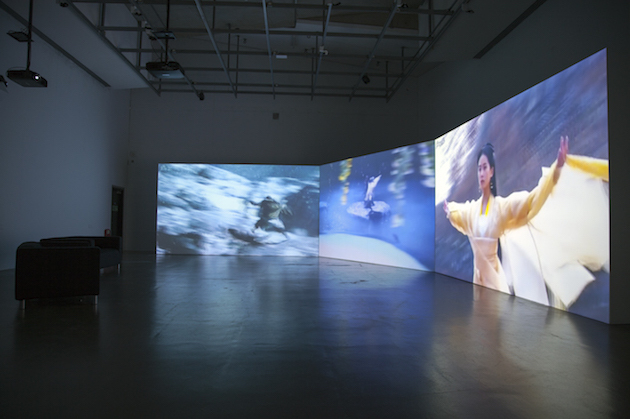 susan pui san lok, Trilogies, 2015, 3-channel digital video installation, 65 mins, Derby QUAD, photo: Bevis Bowden. lok’s work on The Condor Trilogy plays with the spaces of a cultural memory – and invokes the histories that are often overlooked in late twentieth and early twenty-first century British narratives – that of diasporic Chinese experience. ‘Black art’ in postwar, postcolonial Britain has tended to focus on artists of the Commonwealth who relocated to Britain after the end of colonial rule, constituting what have been described as its cultural diasporas. Postcolonial literature and exhibitions of the 1980s and 1990s went some way to representing the experiences of ‘minority’ artists in the post-war decades, though the work by and about artists of the Chinese diaspora in Britain remains sparse. Despite waves of migratory movement from mainland China and Hong Kong since the Opium wars (1839–1942), and the high media profiling of the 1997 Hong Kong handover to China, the former colony has tended to be overlooked, even as interest in artists from mainland China has continued to rise since the 1990s. In terms of second generation postcolonial émigré and British-born artists, the volitional ‘Black art’ movement in the 1980s, led in part by the Blk Art Group members such as Marlene Smith, Eddie Chambers and Keith Piper, and by artist, curator and founder of Third Text, Rasheed Araeen, rarely featured artists from China or East Asia. Those that were occasionally associated with ‘Black art’ through particular shows include Li Yuan Chia, David Medalla, Kumiko Shimizu (The Other Story, 1989) and Lesley Sanderson (various projects with Eddie Chambers). The twentieth century so-called ‘movements’ or ‘waves’ of ‘Black Minority Ethnic’ (BME) art have often been framed in relation to the contemporaneous Diaspora Studies. Theorists of diaspora, working within the humanities, such as Cohen7, Chambers8 and Saffran9, have explored common issues and characteristics of migrated (first and future generations) communities. Diasporic citizens, according to their research, tend to maintain a strong relationship to the cultures of their ‘homeland’, whilst ‘assimilating’ into their ‘host’ environment, creating a sense of in-betweenness and what Homi Bhabha and others referred to as ‘hybridity’ (1994). This may lead to the creation of innovative and/or politicised artworks with diverse cultural reference points or with visual and conceptual elements of travel and movement between locations. However, being an artist and a diasporic subject does not necessarily make a ‘diaspora artist’, nor should the making of diasporic, political art preclude non-diasporic artists. More often than not, artists are disregarded as artists per se. From other disciplinary perspectives, Social Identity Theory and Symbolic Interactionism consider identity in relation to interior and exterior viewpoints – how ‘I’ is constructed in relation to ‘you’ or ‘them’ and vice versa. lok infers in her classic essay, ‘A to Y (Entries for an Inventionry of Dented ‘I’s) that ‘I’ is often absent altogether, within the many ‘Name-In-Capitals’ acronyms applied (often by those whom are not the subjects of said acronym) to designate non-white identities, such as BME, Blk, CWA and so on.13 To be other to the mainstream ‘I’ is not to be an ‘object or condition to understand, possess, obtain, or contract – only something to get at’.14 How ‘I/We’ view ourselves in relation to how we think others view us, and our sense of self/I – or the way that we present ourselves – shifts accordingly. Anthias’s concept of ‘translocational’ identity is useful,15 for acknowledging both the awareness and the flux of how identity can be understood, suggesting that self-identity changes because we constantly reposition ourselves in relation to our physical and experiential surroundings. (Trans)locationality is contingent upon our memories, actions, attitudes and expectations, all of which change in relation to negotiations of place. lok’s merging of perceivable fictions and realities can be seen to present this movement with reference to Chinese, British diasporic’ experience. Her work may seem to represent this experience from the position of a ‘Chinese diasporic’ self (an ‘I’) directed to UK audiences, curators and funding bodies (‘you’/’them’). Part of what RoCH Fans and Legends does then, is to disrupt the notion of essence and location, whether cultural, topographical or artistic by bringing multifarious, transnational viewpoints (and journeys) into one exhibition space. This encourages audiences to reconsider our assumptions and our locatedness – and to consider how and why we ground or tether ourselves or take flight at given times to given places. 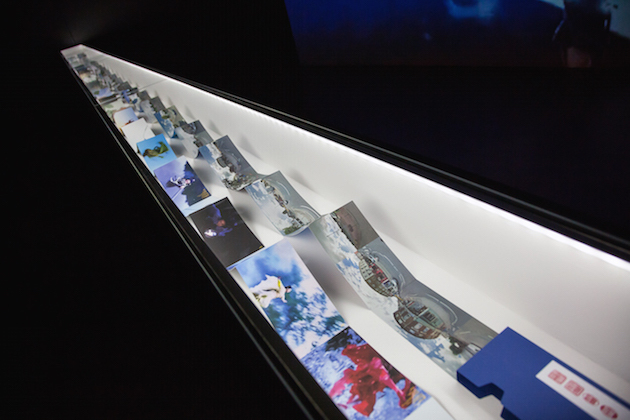 Yet in another context, such as in lok’s recent installations at the 2015 1st Asia Biennial and 5th Guangzhou Triennial at the Guangdong Museum of Art, whose overarching theme was the de-centring of ‘Asia Time’, concepts of ‘I’ and ‘you/them’ may signal different things to the audiences and curators. lok’s mixed media installation brought together elements from the project Golden (2005–ongoing). She installed a room within a room designated by four walls of shimmering metallic strips (Golden (Ballroom), 2006/2015), in which the opening and closing bars of every track of her parents’ record collection of ballroom soundtracks and early Cantopop could be heard (Golden Hour, 2006). A three-minute edit of fifty songs featuring the lyric ‘golden’, nominated by the biennial and triennial artists and curators, echoed around the museum stairwell (Golden (Song V), 2015). Audience responses suggest that such popular cultural sounds and kitschy materials can trigger very specific personal nostalgias, which may feel unique to the observer – a lucky dip in an English village fete, decoration in a newly opened restaurant, a street party or celebration, for example. The multi-perspectival theme continued beyond the walls of the QUAD gallery spaces, where the concurrent exhibition ‘Crouching Fan, Hidden Legend’, presented local, Derby-based artists’ responses to the Condor legends in the stairways, corridors and upper floors. In various media, the works referenced manga/manhua and video game-style representations of the Condor heroes, as well as online fan-fiction, extending and corroborating the intertextual as well as the translocational themes of lok’s work. These commentators of the Condor material could represent the fans to which lok’s exhibition title refers. Their work could be taken for ‘fan art’, with an ambiguous relation to its sources – it was not always clear as to whether this art was celebrating and responding directly to the Condor legends themselves, or to lok’s already existing body of work – perhaps this blurring of distinctions is the point. Visual iconography is always derivative of something from somewhere. Images, like words, make stories, which are retold. Fan fiction, proliferated through social media, augments a fluid and ongoing creative response to material such as The Condor Trilogy, whose many versions are self-derivative, encouraging both repetitions and transmogrifications of narrative elements across prequels and sequels. Hills refers to how fans recreate meaning through their interpretation of the texts, causing an ‘endlessly deferred narrative, whereby fan interpretations cannot ever be closed down by “official” textual knowledge'.16 In a sense, this open-endedness/fluidity of the text is portrayed in the hallways beyond lok’s ‘auteured’ exhibition, where members of the public – her potential or extended fans – actively produce and display fictions, though they are inspired by the same legends as lok. lok continues the construction of the Condor cult, whilst opening it up – in all senses – to new audiences. Fandom can be as organic or as predictable as legend, and legends, like academic theories, can restrain or empower. Legends are, through their own vernacular, inclusive. From this, fans and academics alike can learn. 11 lok, speaking in the Plenary Roundtable at the symposium, ‘The Work Between Us’, Bluecoat Gallery, Liverpool, 20 January 2016, as part of the Black Artists and Modernism AHRC Research Project. Beccy Kennedy is a Senior Lecturer in MA Visual Culture and BA Art History and Curating at Manchester School of Art and has curated for Asia Triennial Manchester. She is Principal Investigator for the AHRC-funded project: ‘Visualising Chinese Borders in the 21st Century’ and is on the editorial board for the Journal of Contemporary Chinese Art.